I’ve been drinking beers (although mostly ones without any real flavor until recently) and reviewed hundreds of coffees in the couple of years, so you’d think that writing a review about beer wouldn’t be so hard…I was wrong. Please bare with me as I find my footing and stumble back to my bar stool. I knew for my first craft beer review, it was going to be a beer from Dogfish Head. A lot of their beers are on my top ten list. However, I had no idea what beer it was going to be until I spotted Aprihop at the local Total Wine. 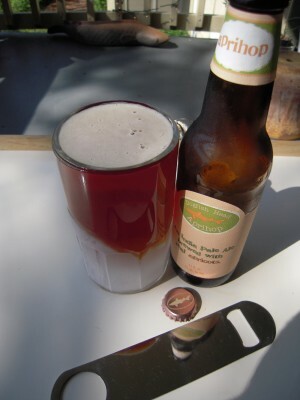 Aprihop is an American IPA brewed with apricots. It’s a seasonal beer only on the shelves and on taps from March to May. I first tried it on tap a few weeks ago, but it wasn’t until I took home a four pack that I was really able to enjoy the full flavor. This beer had an amber color with a hint of orange to it. Aprihop had the aroma of sweet apricot that mixed with a mild bitterness of a good IPA. The taste was lead off my the sweetness of the fruit, followed by an IPA style bitterness. That bitterness lingered on my tongue long after my sip was finished. Overall, Aprihop was a very drinkable IPA, perfect for a warm spring day on the porch. It was too over the top with the hops. It has a light, crisp feel that’s left me wanting to drink a lot more.